Assisted Independent Travel is a new concept in travel and a great way to save time and money while gaining the expertise and insider knowledge of a local travel expert. Costa Rica is one of the safest countries in the world and has an excellent tourism infrastructure. Group tours simply are not necessary, but it’s still nice to have a helping hand with logistics and advice on ways to save time and money. That’s where we step in. When you submit an inquiry it goes directly to our Costa Rica office where one of our professional travel planners immediately goes to work for you. Your advisor will recommend destinations, accommodations, activities and transportation based on your interests, optimized logistics and always with your budget in mind. We will then collaborate with you and fine tune your vacation until it fits you and your travel personality like a tailored suit. After refining your vacation to perfection, we will go to work behind the scenes with our four point confirmation and reconfirmation process to ensure you a smooth sailing vacation. Once you arrive in Costa Rica, we are available for assistance 24/7. We are small enough to care, yet large enough to deliver you the best deals. We will include the latest promotions and provide pricing and payment options to meet your needs. It’s not all about price though as there must be value. We will always include accommodations and tours that provide the best value within your budget. In the end, you will SAVE MONEY and not lose the precious time it takes to research and plan a great vacation. When planning an Assisted Independent Travel trip you will have the FLEXIBILITY to choose what you would like to do. You have the choices of where you want to stay, whether it is local flavored boutique hotels, five star all-inclusive resorts or budget friendly bed and breakfasts. You will not be locked in to certain travel dates or end up stuck on a bus for 10 days with 50 of your newest best friends. You can include a guide for your entire vacation or just on the tours. In the end your vacation will be molded to your desire. We are located in Costa Rica and have many years of experience planning not only our client’s vacations, but also our own. We love Costa Rica and are passionate about what we do. We are constantly traveling and updating our information, offerings and searching for the best deals. As a result, your vacation will not be limited to multi-national hotel chains, but will include accommodations with local flavor, charm, genuine hospitality and the highest levels of service. Of course, if you desire the large chains, we can provide that to you as well, but the choice is yours. Many clients choose a mix of local experiences and adventures and then wind down at a larger beach resort. - A comprehensive online itinerary that is dynamic and loaded with information specific to your vacation. This includes detailed information about all destinations, accommodations, activities and transportation as well as a treasure trove of all of the information needed to plan for your trip. 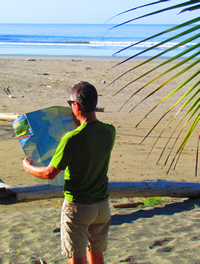 Get started and plan your Costa Rica vacation today!